We’re at Table 17 for our Round 5 Feature Match. 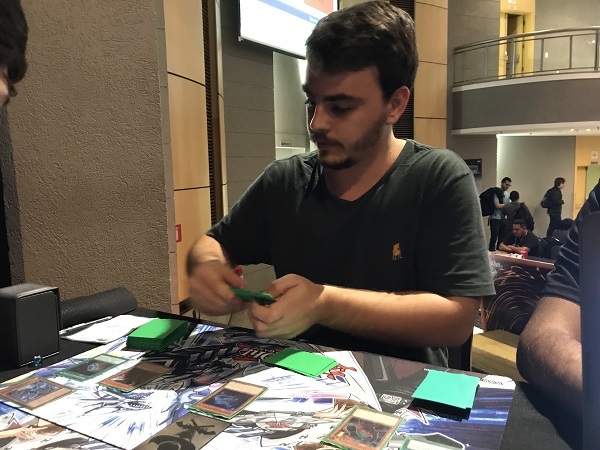 Kelvin Abarno from right here in São Paulo is here with Cyber Dragons, a Deck we’re seen do well in competition taking on Tulio Joaquim Altoe from Espirito Santo, Brazi with True King / Dinosaurs. Both Decks have the ability to explode out of nowhere and end the Duel in a second, so both players will be looking to end things quickly. It’s time to Duel! Altoe won the roll and elected to go first. He passed taking no action. Abarno Normal Summoned Cyber Dragon Core. He activated its effect but Altoe negated it with Ash Blossom & Joyous Spring. Abarno then activated Cyber Revsystem. He Special Summoned Cyber Dragon with the Spell then used Cyber Dragon Vier’s effect to Special Summon itself. Next, he sent Cyber Dragon Core and Cyber Dragon to the Graveyard to Link Summon Cyber Dragon Sieger! He then used Overload Fusion to Fusion Summon Chimeratech Rampage Dragon! He then used Rampage’s effect, sending Cyber Dragon Herz and another Core from the Deck to the Graveyard to have Rampage be able to attack 3 times this turn. In the Battle Phase, Abarno used Sieger’s effect to boost Rampage’s ATK and Rampage’s 3 attacks were enough to end the first Duel! Abarno Set Cyber Dragon Vier and Rivalry of Warlords and passed. In Altoe’s Standby Phase, Abarno activated the Set Rivalry of Warlords. Altoe Set a backrow and passed. Abarno Flip Summoned Cyber Dragon Vier. It attacked directly for 1600. Altoe activated Lost World. He then Normal Summoned Souleating Oviraptor and used the effects of the monster and the Field Spell, then chained his Set Book of Eclipse. He resolved Souleating Oviraptor, sending Babycerasaurus to the Graveyard from the Deck. In the Battle Phase, Souleating Oviraptor attacked the Token and Abarno used Lost World’s effect to destroy another Babycerasaurus from the Deck, whose effect activated, Special Summoning Giant Rex. Abarno Set a card to the back and passed. Altoe’s The Giant Rex and Souleating Oviraptor were used to Link Summon Reprodocus. He then banished 2 Dinosaurs to Special Summon Ultimate Conductor Tyranno. Giant Rex came back to the field since it was banished. Ge then activated Double Evolution Pill, banishing Souleating Oviraptor from the Graveyard and Ash Blossom & Joyous Spring from his hand to Special Summon Overtex Qoatus from the Deck ignoring Summoning conditions. 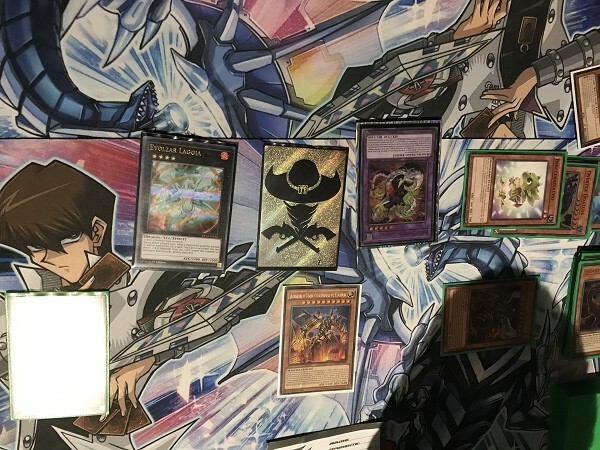 Abarno was holding onto 3 copies of Machine Duplication out of 4 cards in his hand. There was no way to get out of this. We’re going to the third Duel. Abarno elected for Altoe to go first. Altoe started off with Terraforming to add Dragonic Diagram from the Deck to the hand. He activated Dragonic Diagram, destroying a Babycerasaurus in his hand to add True King Agnimazud, the Vanisher. He Special Summoned Souleating Oviraptor and used the effect to add Babycerasaurus from his Deck to his hand. He then Normal Summoned Babycerasaurus and used Souleating Oviraptor’s effect to destroy Babycerasaurus to Special Summon the other one from the Graveyard. Babycerasaurus’s effect Special Summoned Miscellaneousaurus from the Deck. He then activated True King Agnimazud, the Vanisher’s effect from his hand, destroying Miscellaneousaurus and Babycerasaurus. Babycerasaurus’s effect activated again, Special Summoning Giant Rex from the Deck. He then banished Miscellaneousaurus from the Graveyard to Special Summon Jurrac Aeolo from the Deck. He then used it, Giant Rex and Souleating Oviraptor to Synchro Summon Trishula, Dragon of the Ice Barrier! Its effect banished an Ash Blossom & Joyous Spring from Abarno’s hand. 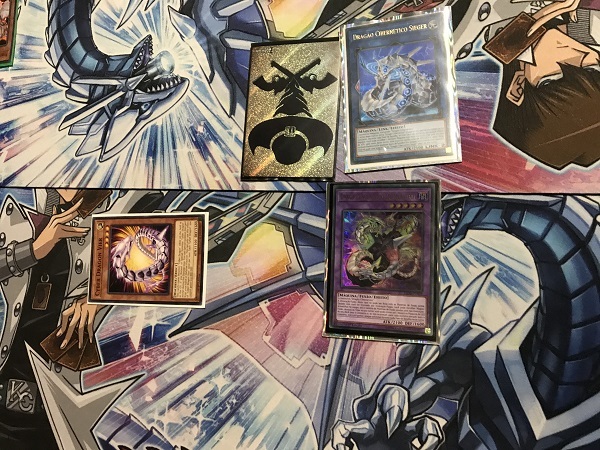 Next, True King Agnimazud, the Vanisher and Trishula, Dragon of the Ice Barrier were used to Xyz Summon True King of All Calamities! In Abarno’s Standby Phase, Altoe activated True King of All Calamities’s effect declaring LIGHT. This prevents Abarno from activating any of his LIGHT monster effects, but it doesn’t stop him from Tributing Altoe’s True King of All Calamities to Special Summon Jizukiru, the Star Destroying Kaiju to Altoe’s field. Abarno Set a Cyber Dragon Herz and Called by the Grave and passed. Altoe activated Dragonic Diagram, destroying Overtex Qoatus from his hand and adding True King Bahrastos, the Fathomer from his Deck to his hand. After the chain resolved, Altoe activated Overtex Qoatus but Altoe chained Called by the Grave to banish Overtex Qoatus and negate the effect. Altoe activated Lost World then Altoe Special Summoned Ultimate Conductor Tyranno by banishing Giant Rex and Babycerasaurus. Giant Rex hopped back to the field. Giant Rex attacked the Token and Altoe used Lost World to destroy Babycerasaurus from his Deck to keep the Token on the field. Babycerasaurus’s effect Special Summoned Souleating Oviraptor which added another copy to his hand. 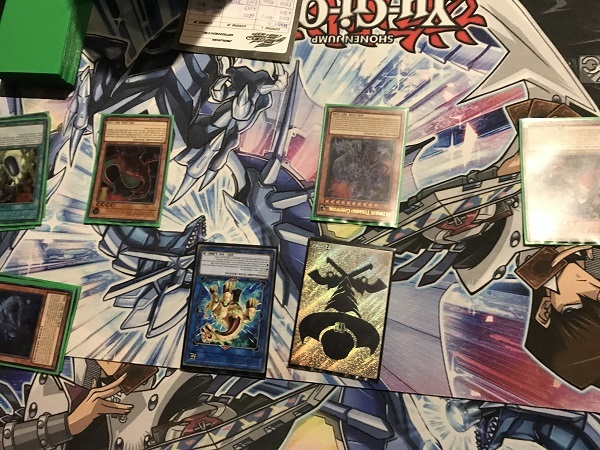 Ultimate Conductor Tyranno then attacked into the face-down Cyber Dragon Herz whose effect let Abarno add Cyber Dragon from his Deck to his hand. Ultimate Conductor Tyranno attacked and destroyed the Token, then the rest of his monster attacked directly, leaving Abarno at just 900 LP. In Main Phase 2, Altoe used Giant Rex and Souleating Oviraptor to Xyz Summon Evolzar Laggia! Altoe drew another Cyber Dragon Herz. He discarded it to Special Summon Galaxy Soldier. He used Herz’s effect to add another Cyber Dragon to his hand while Galaxy Soldier’s effect added another Galaxy Soldier. He Special Summoned the second Galaxy Soldier by discarding the other Cyber Dragon. Both Soliders were used to Xyz Summon Cyber Dragon Nova. 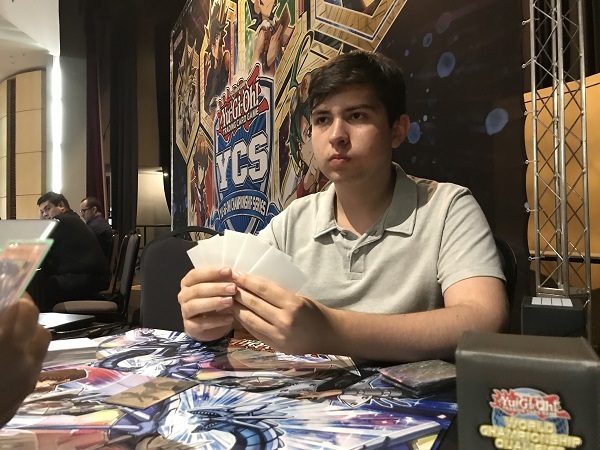 Before Abarno could Summon Cyber Dragon Infinity, Altoe used Ultimate Conductor Tyranno’s effect, destroying the True King Bahrastos, the Fathomer to turn Nova face-down. The True King’s effect Special Summoned another True King Agnimazud, the Vanisher from the Deck. Next, Abarno Tributed the face-down Nova to Tribute Summon Cyber Dragon. Altoe negated the Summon with Evolzar Laggia’s effect. (Doing this protected the Jizukiru, the Star Destroying Kaiju from a possible Chimeratech Fortress Dragon play) Abarno activated the last card in his hand, Overload Fusion. His only option was Chimeratach Rampage Dragon which wasn’t enough to defend his Life Points. Tulio Joaquim Altoe takes the win with True King / Dinosaurs!